Flynn, Py & Kruse is a general practice law firm dedicated to providing quality solutions for complex legal problems. Experienced and capable, the firm's attorneys work diligently to achieve results for clients in a timely, efficient and cost-effective manner. Flynn, Py & Kruse focuses on the practice of business law, civil litigation and estate planning and probate. 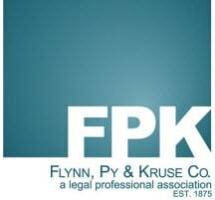 Founded in 1875, Flynn, Py & Kruse has earned wide recognition throughout the state of Ohio for its trial advocacy skills. As a general practice law firm, the attorneys at Flynn, Py & Kruse can address virtually any legal problem clients may face. This multidisciplinary approach enables them to perceive the big picture, identify potential problems that lie beneath the surface and take measures to limit risks. Flynn, Py & Kruse combines modern thinking, a team approach and a high level of service to deliver results for its clients. Attorneys and staff build upon this legacy every day, working diligently to provide clients with vigorous representation, incisive advice and efficient legal services. Flynn, Py & Kruse serves corporations, small businesses, non-profit organizations, individuals and other clients from its offices in Sandusky and Port Clinton. Call 419-625-8324 (Sandusky) or 419-734-3174 (Port Clinton) to schedule a consultation with an experienced lawyer.